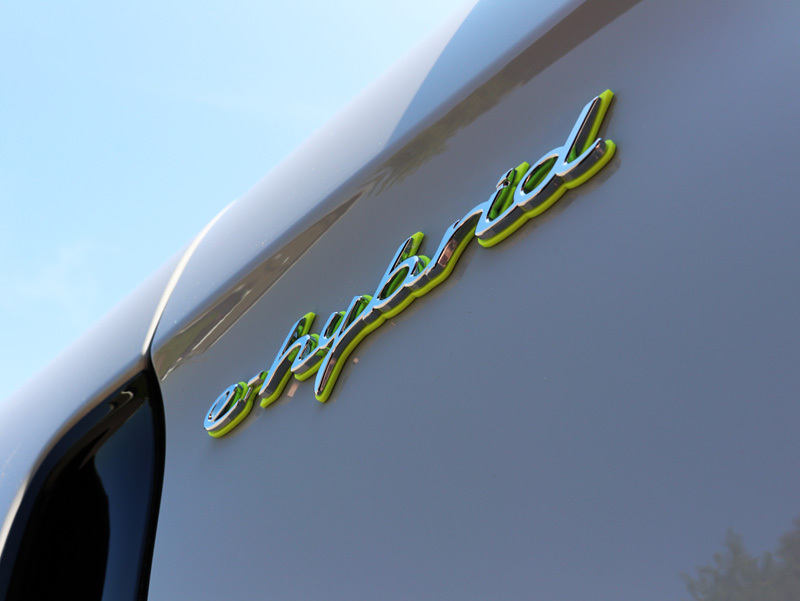 Some car manufacturers envision an all-electric future, but with the release of the Panamera Turbo S e-Hybrid (PTSEH), Porsche seems to have planted its feet firmly in the hybrid camp. Taking the plug-in tech used in the 918 Spyder hyper car, Porsche’s range-topping Turbo S e-Hybrid is their response to Tesla, delivering a passenger car that combines electric power with Porsche luxury. 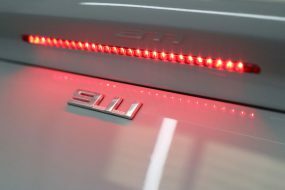 In fact, the PTSEH marks the first time in the German manufacturer’s history that a plug-in hybrid sits at the top of a range. The power produced is guaranteed to either be heart stopping or set your pulse racing, depending on your reaction to visceral acceleration, albeit with zero noise! 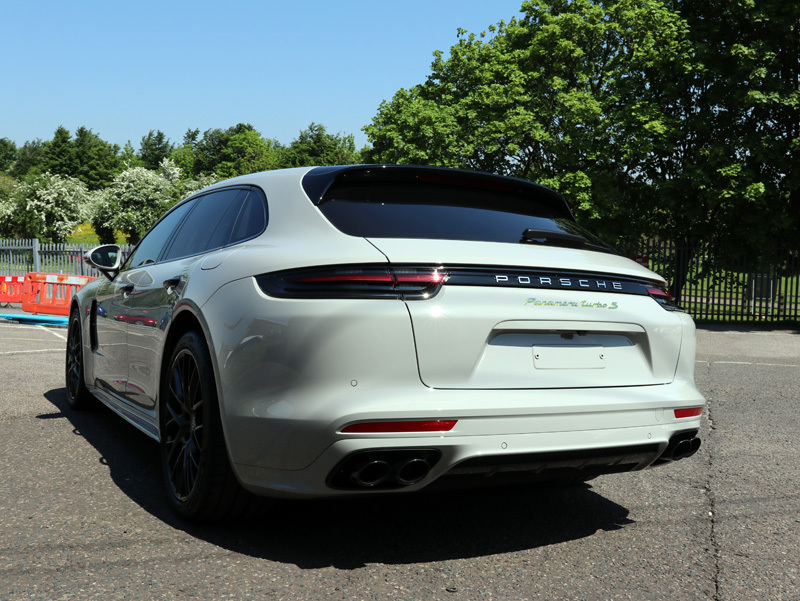 Using a 14kWh lithium-ion drive battery, 134bhp electric motor and high-voltage power electronics of the existing Panamera 4 E-Hybrid ‘PHEV’, with the 4-litre, 542bhp twin-turbo V8 petrol engine of the Panamera Turbo, the Turbo S e-Hybrid delivers 0-62mph in just 3.4 seconds. For this sprint, therefore, it could match the 911 GT3 off the line. The hybrid’s powertrain sustains the momentum of the initial burst of energy, powering through to cover the 62mph – 124mph leg in 8.5 seconds ensuring it firmly pins passengers and driver to their seats! Crazily, top speed finally caps out at just under 193mph! The PTSEH also has the familiar 8-speed dual-clutch automatic gearbox with manual shift mode, air suspension as standard and drivers will be reassured to know it benefits from ceramic composite brakes, Porsche Dynamic Chassis Control Sport (PDCC Sport), Porsche Torque Vectoring Plus (PVT Plus), and a steering rear axle like the 918 Spyder’s. It’s heavy! With all that electric technology the e-Hybrid weighs in at 2310kg, a whopping 315kg more than the standard Turbo S and all that extra weight doesn’t bode well for fuel efficiency, with early reported figures putting the claimed 97.4mpg seriously into question. All the same, the e-Hybrid boasts a clever setup, firing up in electric mode capable of delivering, on paper at least, a range of 31 miles. However, this figure varies widely depending on driving style and conditions, as stop-start city traffic will see that figure halved. 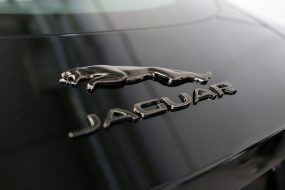 Step on the right pedal enthusiastically, and the petrol engine takes over, notifying the driver using the ‘eco display’. Keep it in the electric zone with some right foot management and the regeneration technology comes into play, feeding back into the battery cells. When it comes to proper charging, there are two chargers to choose from: the 3.6kW which comes as standard and requires 6 hours to replenish the battery cells; the 7.2kW charger, on the other hand, takes just 2.4 hours! In true high-tech, futuristic style, the Porsche Connect app for smartphones (and Apple Watch) allows charging times, air conditioning and heating all to be controlled remotely. All in all, the PTSEH should be viewed as a car designed to navigate zero emission zones and making a serious statement whilst doing so! The same could be said out of the city, but chances are, you’ve accelerated and disappeared so quickly and quietly, your audience will be left wondering whether they really saw a Porsche or a UFO! The owner of this car had been driving it for a few months prior to arranging a detailing treatment. 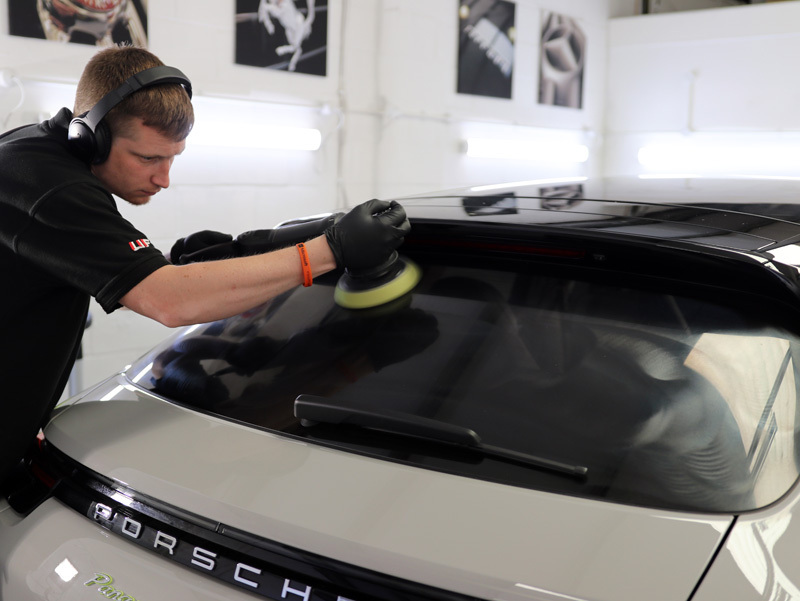 When the car arrived, inspection revealed unusually (for Porsche) soft paintwork which would require machine polishing to remove scratches and swirls that had already appeared in the unprotected clear coat. 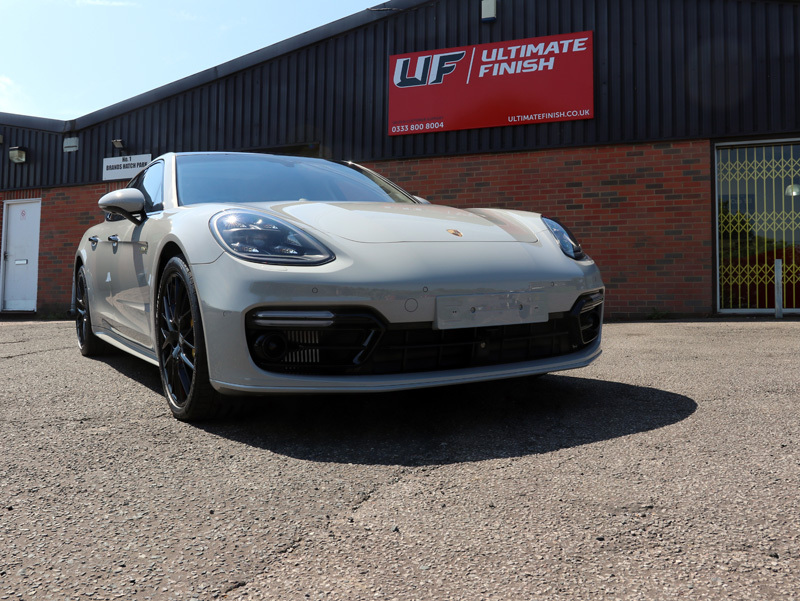 After consultation, the owner opted for a Gloss Enhancement Treatment upgrading the final protective sealant to Gtechniq Crystal Serum Ultra (CS Ultra). 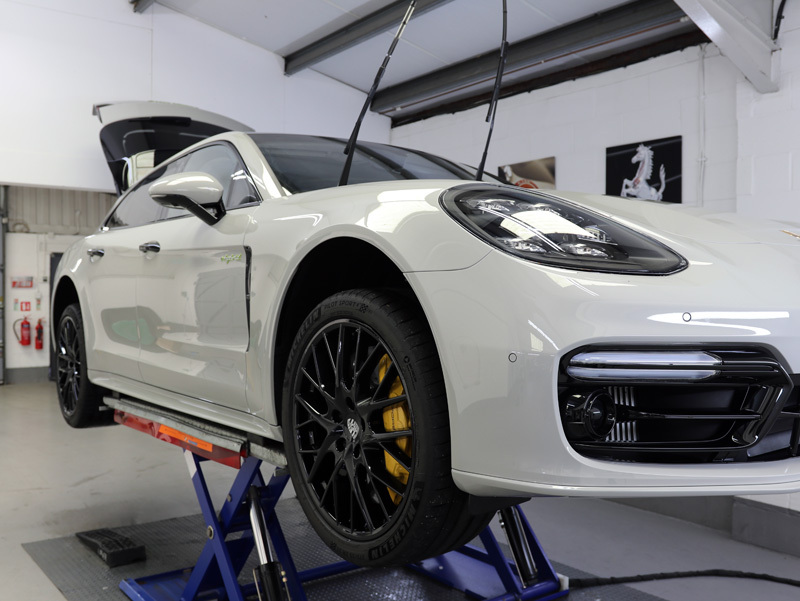 Getting the Panamera protected started with decontamination of wheels, wheel arches and paintwork. 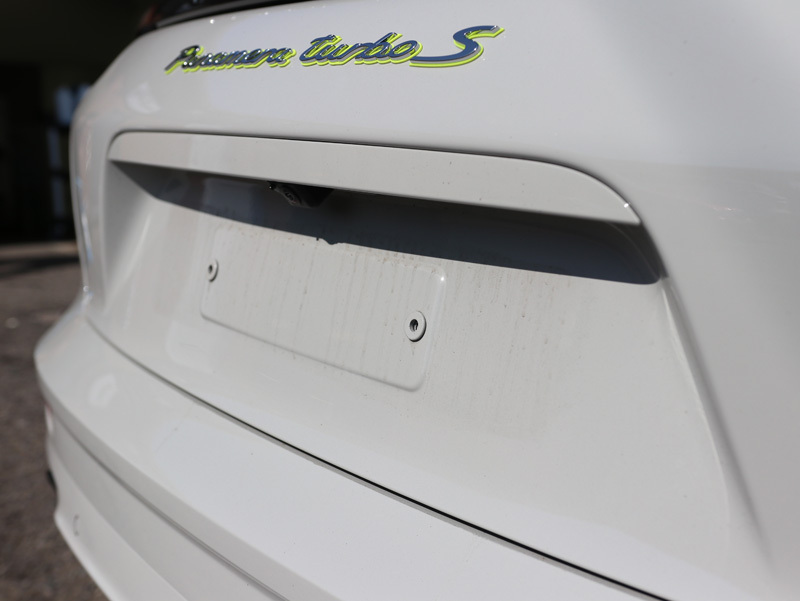 The number plates were first removed to ensure the area behind could be completely cleaned. This prevents wash water becoming trapped behind the plates, mixing with dirt caught there and sending grey-black streaks of water from running down the bodywork later. 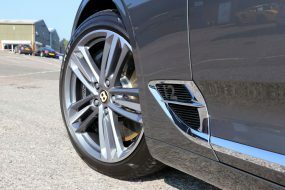 The wheels and arches were first degreased using Gtechniq W5 Citrus All-Purpose Cleaner, using a Kwazar Orion Super Pro+ Pump-Up Sprayer to reach up underneath the wheel arch ensuring the cleaning solution covered the entire area. 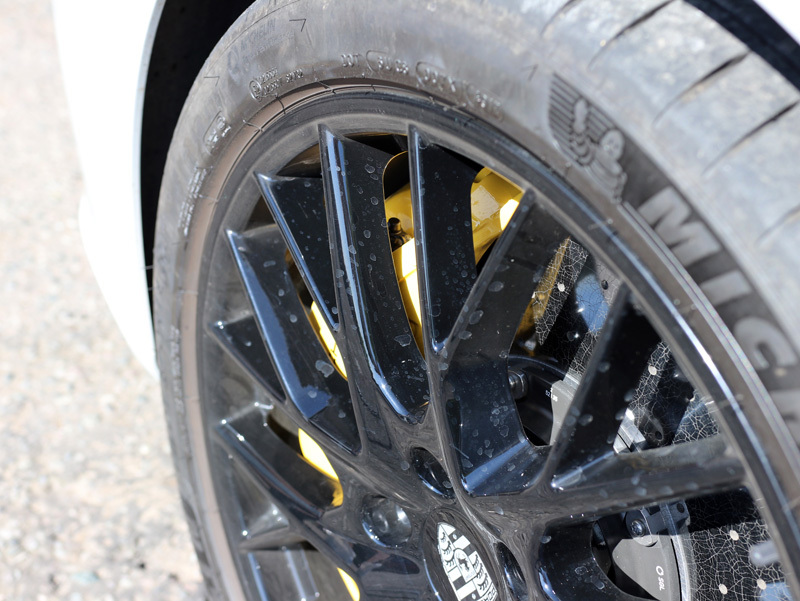 After rinsing the area, the wheels were cleaned using Valet Pro Bilberry Wheel Cleaner and Wheel Woolies. These long-handled wheel brushes are available in different sizes, with heads to fit through even the most intricate of alloy wheel designs, allowing cleaning through to the back of the rim. After rinsing, the bodywork was treated with W5 to ensure all traces of bird droppings, other environmental fallout, and greasy road grime splatters were eliminated. The car was then pre-cleaned using Ultimate Snow Foam, applied through a foam lance attached to a pressure washer. The high-foaming solution, combined with the pressurised water from the Kranzle K-1152 creates a thick lather that clings, even to vertical surfaces for longer dwelling times and improved cleaning power. The bubbles lift the larger particles of dirt and grit away from the surface of the panels and allow them to be easily rinsed away. With these elements removed, there is less opportunity for the paintwork to become scratched or swirled once a wash mitt comes into contact with the surface. 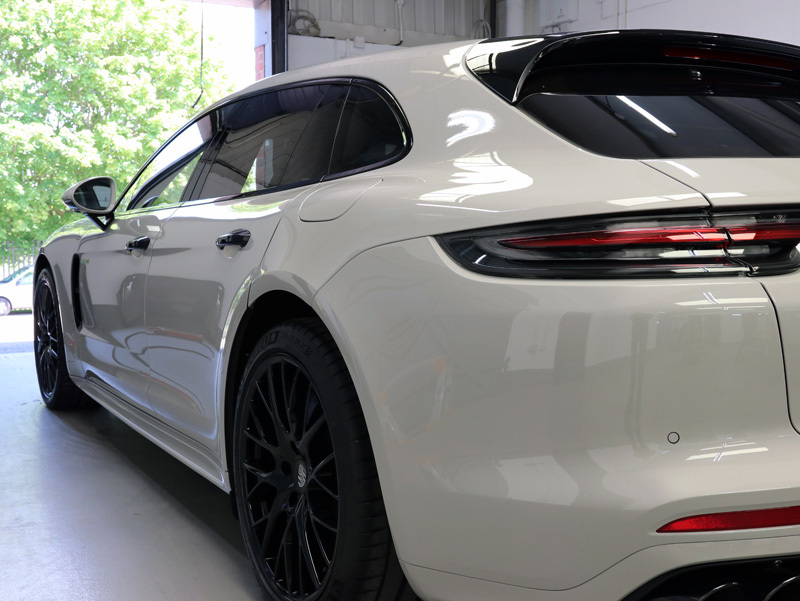 The Panamera was washed thoroughly using the Two Bucket Method and Gtechniq G-Wash, a pure shampoo without additives or gloss enhancers, the presence of which would leave residues on the paintwork. The Two Bucket Method keeps wash solution separate from rinse water, helping prevent cross-contamination from a dirty mitt being washed and rinsed in the same water. The mitt is loaded with soapy water, a panel washed, the dirty mitt rinsed in the Rinse Bucket and brushed across a Grit Guard, releasing particles from the pile. The mitt is wrung out before being reloaded with the soapy solution from the Wash Bucket. After rinsing the suds away, an Aqua Gleam De-ionising Water Filter was attached inline with a hose to deliver a final, pure water rinse. The media inside Aqua Gleam neutralises the impurities found in tap water responsible for causing white marks, the water spot deposits associated particularly with hard water areas. Using inline with a hose, rather than attaching to a pressure washer, ensures maximum longevity of the media. The Panamera was brought into the studio, placed on a hydraulic ramp and dried using a BigBoi BlowR Pro car dryer. 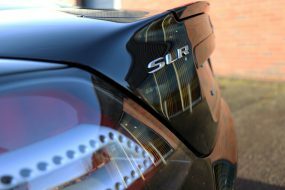 This touchless system has been developed specifically for the detailing industry. Using a powerful twin motor, BlowR Pro directs a strong jet of warmed, filtered air to chase water off panels and out from areas inclined to trap water, such as around wheel nuts and door mirror housings. The paintwork was then inspected thoroughly under high-intensity lighting. Details of blemishes were recorded on the vehicle appraisal sheet for reference during machine polishing. Multiple paint depth readings were taken across each panel to ensure the paintwork had been applied uniformly. 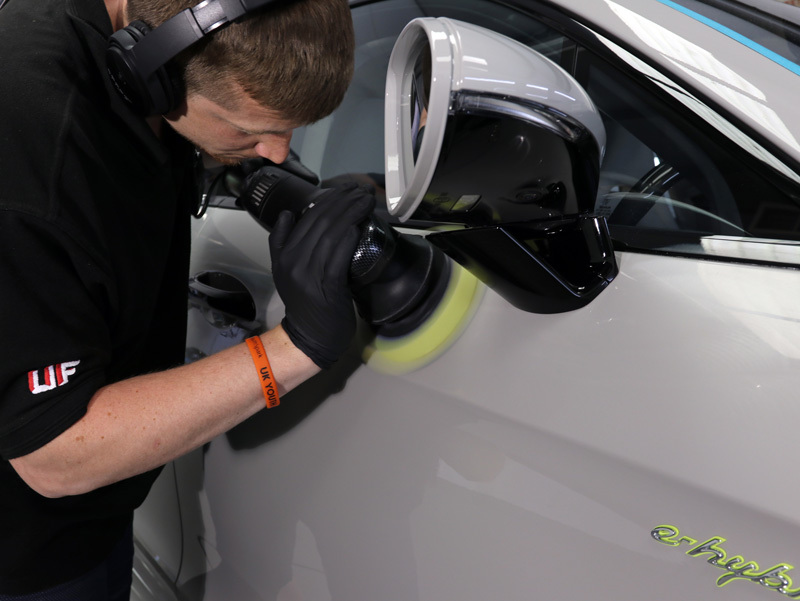 The correction and refining stages were completed using a RUPES LHR12E Duetto dual action polisher. The 12mm throw corrects paintwork like a rotary, but with all the safety of a Dual Action whilst drastically reducing polishing time to produce optimum results efficiently. As previously discussed, the paintwork was unusually soft, so although initially a Kamikaze Collection Banzai Dynamics Red Polishing Pad was used with Menzerna Medium Cut 2400, the combination produced unsatisfactory results, leaving micro-marring in the clear coat which affected the overall gloss levels. Switching to a RUPES Yellow Polishing Pad produced smoother, cleaner results with a much higher gloss. 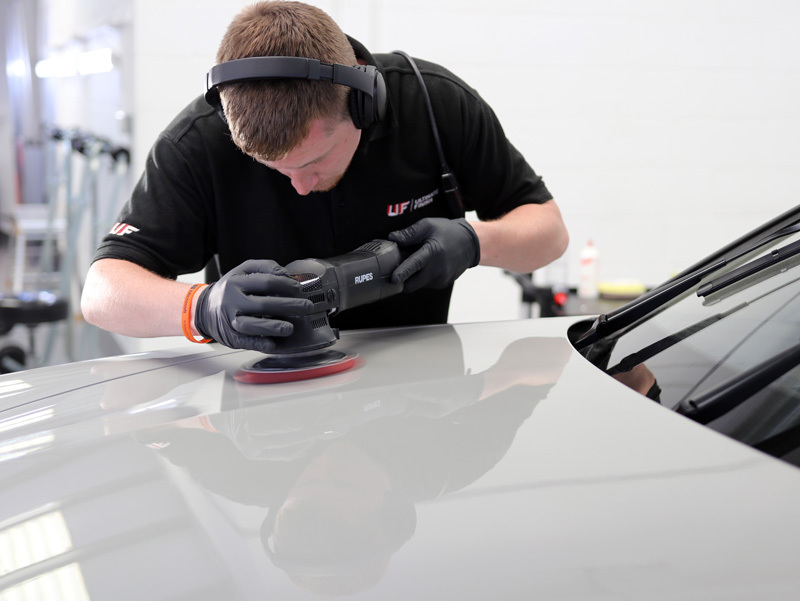 The car was sprayed with Gtechniq Panel Wipe and buffed off to ensure all traces of polish or silicon residue had been removed, leaving the surfaces ready to accept the final coating. CS Ultra was then applied to the paintwork, glass and head and tail light covers. 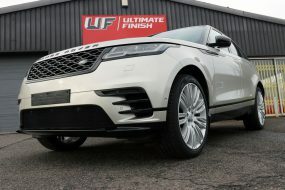 Whilst CS Ultra provides extreme protection for clear coats, adding a layer of EXO V3 Ultra Durable Hydrophobic Coating provides additional hydrophobic properties, encouraging rainwater and dirt to be repelled, inhibiting contamination from adhering to treated surfaces. 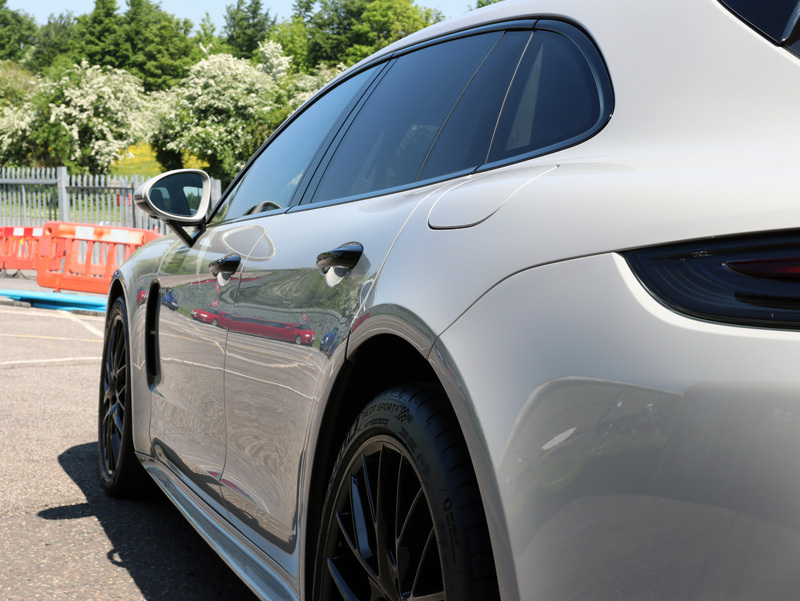 A layer of EXO v3 was therefore applied to provide enhanced slickness and shine, making the solid, light grey paintwork highly reflective and gloriously glossy! With Gtechniq warranting the coating for 9-years, this Panamera is certain to be future proofed!